Doctors have traditionally had limited treatment options to offer adults with B cell acute lymphoblastic leukemia (ALL), a rapidly progressing form of blood cancer. The disease often returns, or relapses, after initial treatment with chemotherapy. At that point, patients are often resistant to additional chemotherapy and poor candidates for stem cell transplantation, which is usually effective only if the disease is in complete remission. Now Memorial Sloan-Kettering investigators report that genetically modified immune cells have shown great promise in killing the cancer cells of patients with relapsed B cell ALL. In fact, all five of the patients who have received the new therapy – known as targeted immunotherapy – have gone into complete remission, with no detectable cancer cells. The results of this ongoing clinical trial were reported online on March 20, 2013 in the journal Science Translational Medicine. “This is a very exciting finding for patients with B cell ALL and a major achievement in the field of targeted immunotherapy,” says Dr. Michel Sadelain, Director of Memorial Sloan-Kettering’s Center for Cell Engineering, who led the study along with medical oncologist Dr. Renier J. Brentjens. Targeted immunotherapy is aimed at instructing the immune system to recognize and attack tumor cells. Over the past decade, Drs. Sadelain and Brentjens, and other Memorial Sloan-Kettering researchers – including Dr. Isabelle Rivière, Director of Memorial Sloan-Kettering’s Cell Therapy and Cell Engineering Facility, and physician-scientist Dr. Marco L. Davila – have investigated an approach that involves removing white blood cells called T cells from patients and introducing a new gene into the cells using an engineered viral vector. A modified version of an eye test used to assess visual acuity in the military has been given to archerfish by scientists to help explain how these remarkable fish are able to accurately spit down tiny insects high above the water’s surface. Dr. Shelby Temple, now at the University of Bristol in the UK, and his team at the University of Queensland and the University of Western Australia used a modified version of the Landolt C test to discover just how fine a detail the archerfish could resolve. The researchers first trained the fish to spit at one of two letters – an ‘O’ or a ‘C’ – by rewarding them with food. Then they showed them small versions of both letters together and recorded which letter they spat at. Dr. Temple said: "This modified Landolt C test works because the only difference between the two letters is the gap in the ‘C’ so in order to tell the difference and spit at the right target to get their reward the fish must be able to resolve the gap." To test the archerfish's resolving power, the size of the letters were decreased in steps to see just how small they could go. The scientists then compared these behavioural results to the fishes' predicted acuity based on measurements of the photoreceptor density in their retinas. 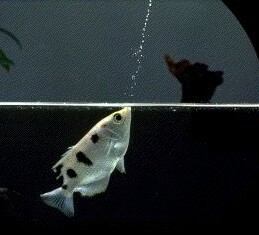 The results, published online ahead of print in the journal Vision Research, show that archerfish are one of the most visually acute freshwater fish, able to resolve approximately 3.5 cycles per degree with the part of their retina that looks up and forwards, which is not surprising given their interesting foraging strategy. Archerfish have a special way of hunting for food that involves spitting jets of water at aerial insects above the water’s surface. It’s a theory much discussed in the media – that animals and humans are able to smell certain genes linked to the immune system – which in turn influences their choice of mate. The genes in question are known as MHC (major histocompatibility complex) genes. Selecting a mate with very different MHC genes from one’s own makes sense, because your offspring will then have a greater variety of immunity genes – and a correspondingly greater resistance to disease. But until now, no scent offering information about MHC genes had been discovered among those scents emitted by humans and animals. Now researchers from the University of Tübingen’s Immunology department and the Proteome Center in Germany, working with their colleagues from the University of Saarland, also in Germany, have managed to do just that. Their results, published online on March 19, 2013 in Nature Communications, will lead scientists to review the “sniff out a mate” theory. It is well known that the MHC genes determine which MHC peptides a cell presents at its surface to the immune system’s killer cells. These peptides are usually composed of the body’s own proteins and therefore do not set off any reaction. But if the MHC peptides come from a virus, the immune system’s killer cells can recognize that and attack it. According to one current theory, the MHC peptides also communicate the smell which offers information about MHC genes – a theory tested in mice. Special sensor cells were found which are able to recognize and distinguish the various MHC peptides from one another. Experiments have shown that synthetic MHC peptides in high concentrations were able to influence the behavior of mice, and that mouse urine carries what is believed to be the smell of MHC genes. Until now, it was not known whether MHC peptides even occurred naturally in urine.